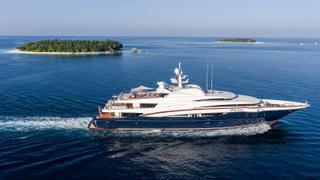 The 75.5 metre motor yacht Anastasia, jointly listed for sale by Andrew Bond at Fraser and Burgess, has been sold. Built by Dutch yard Oceanco in steel and aluminium to a design by Sam Sorgiovanni and delivered in 2008, her sleek profile houses seven decks of outstanding accommodation, including a duplex master suite, cinema and main saloon that doubles as a nightclub. 12 guests are accommodated in a master suite, two VIP staterooms and three double cabins, all with full en-suite facilities. In addition, there are quarters for 26 crew aboard this yacht for sale. Half of the lower deck is dedicated to an enormous garage which houses large custom tenders, a vast array of jet skis, wind surfers and full dive equipment. Hullside doors fold down to assist with launching the water toys and also create huge balconies over the sea. Offering every available luxury, she boasts a Jacuzzi and enclosed gym on her split-level sundeck, a cinema and a touch-and-go heli deck. Twin 3,650hp MTU engines give her a range of 4,400 nautical miles at 14 knots. Anastasia was asking €67.5 million.